Source: University of Virginia, Miller Center of Public Affairs, www.millercenter.virginia.edu, May 17, 2007. 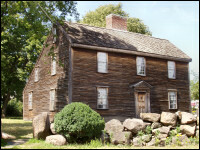 Born: October 30, 1735, North Precinct of Braintree (now Quincy), Massachusetts. Education: Harvard College (graduated 1755). 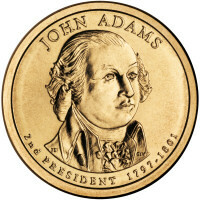 President: One term (four years) from 1797-1801. Died: July 4, 1826, in Quincy, Massachusetts. Interred: United First Parish Church: Quincy, Massachusetts. Source: www.WhiteHouse.gov, May 17, 2007. Act of February 1, 1798: This Act suspends, for a period of three years, a portion of the Act of February 9, 1793, relating to the acceptance of foreign coinage as legal tender in the United States. Act of April 24, 1800: This Act authorizes the purchase of copper equivalent to the number of cents and half-cents produced during the prior year, and authorizes an annual purchase to continue the striking of these coins. Act of March 3, 1801: This Act directs the location of the United States Mint to remain in Philadelphia until March 1803. Source: www.USMint.gov, May 17, 2007. John Adams America's Story from America's Library , the Library of Congress. John Adams (1735 - 1826) American President: An Online Reference Resource from the Miller Center of Public Affairs, University of Massachusetts. In-depth information reviewed by prominent scholars on each President and administration. John & Abigail Adams Companion site to PBS American Experience program. Purchase John & Abigail Adams from Amazon.com. John Adams John Adams from Wikipedia, the free encyclopedia. Presidential Inaugurations: John Adams Presidential Inaugurations is presented by the Library of Congress, and other governmental departments, in collaboration with the Avalon Project at the Yale Law School. This presentation includes diaries and letters of presidents and of those who witnessed inaugurations, handwritten drafts of inaugural addresses, broadsides, inaugural tickets and programs, prints, photographs, and sheet music. 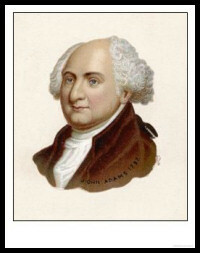 ADAMS, John, (1735 - 1826) Biographical Directory of the United States Congress. John Adams Papers "The Papers of John Adams" from The Avalon Project at Yale Law School . A Tradition of Celebration by the Adams Family Researched by James R. Heintze, Assistant University Librarian, The American University. All Rights Reserved. 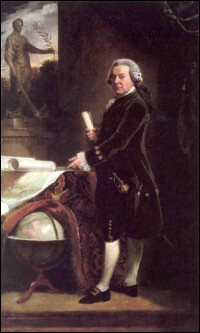 John Adams (1735-1826) Biography of John Adams from the Massachusetts Historical Society. Adams National Historic Park Adams National Historical Park tells the story of four generations of the Adams family (from 1720 to 1927). The park has two main sites: the Birthplaces of 2nd U.S. President John Adams and 6th U.S. President John Quincy Adams, and Peacefield including the "Old House," home to four generations of the Adams family, and the Stone Library which contains more than 14,000 historic volumes. John Adams , by David McCullough, 736 pages, Simon & Schuster (May 22, 2001). The Letters of John and Abigail Adams , by by Abigail Adams, John Adams, Editor: Frank Shuffelton, 512 pages, Penguin Classics (December 30, 2003). John Adams: The American Presidents Series , by John Patrick Diggins, 224 pages, Times Books; 1st ed edition (June 11, 2003). John Adams and the Spirit of Liberty , by C. Bradley Thompson, 340 pages, University Press of Kansas (November 1998). The Revolutionary John Adams , by Cheryl Harness, Reading level: Ages 9-12, 48 pages, National Geographic Children's Books (January 1, 2003).